What we have here is the granddaddy of all modern Ducatis: the Pantah, looking outrageous and bat-winged. Designed by Fabio Taglioni as a replacement for the aging bevel-drive valve gear, it featured single overhead cams and two valves per cylinder. The new powerplant lost the complicated and expensive tower-shaft and bevel-drive arrangement for the cams, but retained the signature desmodromic valve-actuation. There was no specific performance advantage gained from the change, but production costs and mechanical noise were significantly reduced. 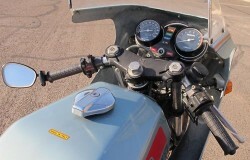 It was also the first Ducati to feature the signature trellis frame. The classic silver, red, and blue paint is currently available on the retro-styled replacement body panels for the modern Monster. 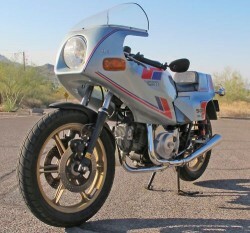 When introduced in 1979 the bike had impressive specs: 50 hp from its 500cc’s. Wet weight was 443 lbs. and the bike had a top speed of 115mph. 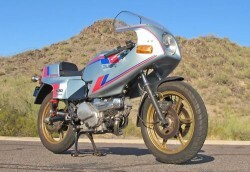 The 500 was superseded by the 600 model in 1981. The paint job is original and in excellent condition. So is the seat upholstery. The cam belts, oil filter, oil and battery were replaced last month. The valve clearances were checked and are within spec. Front and rear hydraulic brake oils have been replaced. The carbs have been cleaned, adjusted and synched. The two into one exhaust system is made by BUB Enterprises. The tires have good tread left. Michelin Macadams. The shocks are the original Marzocchi remote reservoir type. As the photos show, the bike has never been down. 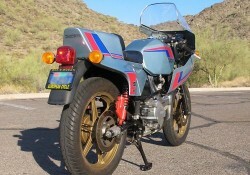 The bike retains the original air filter system. All functions on this bike work properly: turn signals, horn, idiot lights, etc. hard to find and very expensive Jod duplo headlamp lens. The Buy It Now price is at $5,000.00, which seems a little pricey for these, but it’s hard to compare: they’re not available for sale very often. 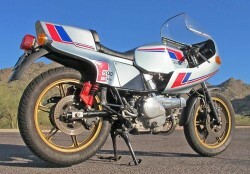 The bike isn’t cheap, but seems a small price to pay for such an interesting piece of Ducati history. And it should be no more expensive to maintain than any other two-valve Ducati, but it definitely helps to be handy with wrenches and feeler gauges and do your own valve adjustments.